I have long noted Russia’s resurgence back into the ranks of the leading Great Powers; I predicted that the global economic crisis will not have a long-term retarding impact on the Russian economy; and within the past year I have bought into Stratfor‘s idea that the defining narrative now in play in Eurasia is Russia’s intention to reconstruct its empire / sphere of influence / call-it-what-you-will in the post-Soviet space. This “resurgence” is advancing along several major fronts: geopolitical, economic, demographic, military, and ideological. In this post I will cover recent major news on the first four. Ukraine Returns to the Empire? The most consequential big event is the electoral victory of Viktor Yanukovych (35%) in the first round of the Ukrainian presidential elections, followed by Yulia Tymoshenko (25%), Serhiy Tihipko (13%), Arseniy Yatsenyuk (7%), and Viktor Yushchenko (5%) – a result that I called 100% accurately. Disillusioned with the incompetence, economic decline, and “anarchic stasis” of five years of Orange rule, polls indicate three times as many Ukrainians now favor a “strong leader” over a “democratic government”, so no wonder that the liberal ideologue Yushenko, though the only major Ukrainian politician who is consistent and sincere in his views, suffered a crushing defeat as the last true representative of the Westernizing “Orange” movement. This marks a threshold in the accelerating “regathering of the Russian lands”*. 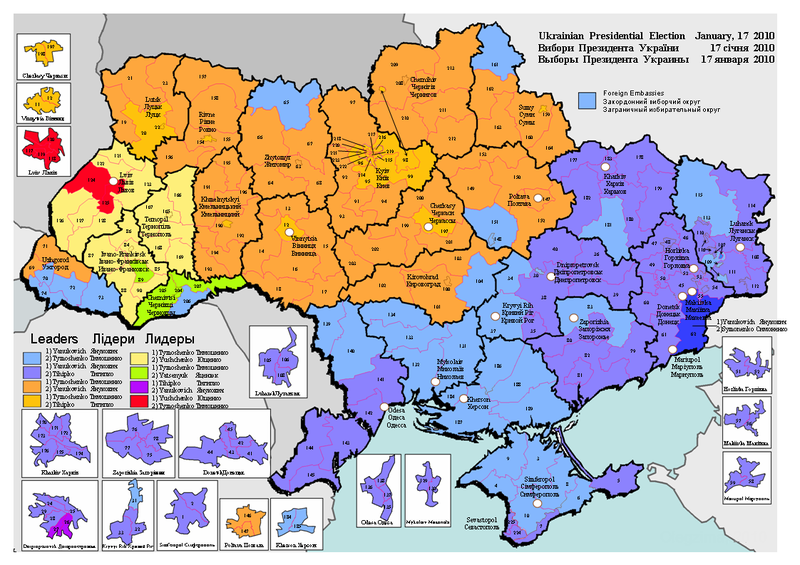 Below is an electoral map of the first-round Ukrainian presidential elections. As is always the case, the urban, Russophone / Surzhyk-speaking, Russian Orthodox Church-affiliated south and east voted for the pro-Russian Yanukovych, head of the Party of Regions, while the more bucolic, Ukrainian-speaking, Kyiv Patriarchate-affiliated / Uniate center and west favored Tymoshenko. [Click on map to enlarge]. 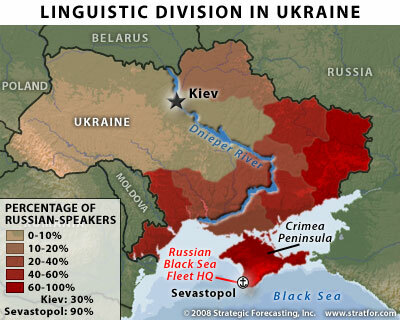 This reflects the civilizational fault-line riveting Ukraine in half – commonly assumed to be along the Dnieper River, but more accurately, dividing the country into a pro-Russian south and south-east, the independence-minded Ukrainian center, and the pro-Western south-west. Back in 2004, there was a clearly defined pro-Russian (Yanukovych) and pro-Western (Yushscenko) force. Yushscenko prevailed thanks to incompetent vote rigging on the part of the Party of Regions and a Western-supported popular uprising known as the Orange Revolution. The oranges are now regarded as rotten and nothing of the same sort can happen in 2010, since both Presidential contenders are now, for most purposes, beholden to Russia. Yanukovych supports closer political and economic ties with Russia, would renounce NATO and EU accession plans, and enjoys the support of the Donbass oligarchs (including Ukraine’s richest man and king-maker, Rinat Akhmetov) and the senior managers of the Ukrainian military-industrial complex. There has been talk of a possible political union between United Russia (Russia’s “party of power”) and the Party of Regions, which will lay the institutional foundations for closer union with Russia, Belarus, and Kazakhstan, involving joint membership in Eurasec, a customs union, and even the CSTO. Finally, there have been rumors that Yanukovych will retain Yushenko in some minor political position, as a placebo for the west Ukrainians in order to nip secession movements in the bud and to undercut Tymoshenko’s support in a crucial region. Tymoshenko is the unprincipled, chameleon-like politico par excellence, repeatedly reinventing herself from hard-hitting gas oligarch / robber baroness, to Lesya Ukrainka-inspired Orange liberal nationalist, to Putin-friendly aspiring Czarina. She has negotiated a well-publicized gas deal with Russia, took part in the sale of the major Ukrainian steelmaker, the Industrial Union of Donbass, to a Kremlin-friendly Russian industrial group, and publicly backed away from NATO membership. In doing this, she has tried to ride the geopolitical and emotional wave of the Russian resurgence, and succeeded in gaining the firm support of the central regions. However, although singularly charismatic in the gray world of Ukrainian politics, she has been unable to significantly penetrate into the Party of Regions electoral base. Coupled with low voter turnout in Ukraine’s western regions, due to their disillusionment with her newly-discovered Russophilia, this means that she will almost certainly lose out to Yanukovych in the second round of elections scheduled for February 7th** (assuming no extralegal interference from the 3000 strongarm Georgian “election observers” who are in Ukraine just for the girls, supposedly). Ukraine by contrast has the Carpathians to its west, a handy little barrier that has deflected invaders of all stripes for millennia. These mountains defend Ukraine against tanks coming from the west as effectively as they protected the Balkans against Mongols attacking from the east. Having the Carpathians as a western border reduces Russia’s massive defensive burden. Most important, if Russia can redirect the resources it would have used for defensive purposes on the Ukrainian frontier — whether those resources be economic, intelligence, industrial, diplomatic or military — then Russia retains at least a modicum of offensive capability. And that modicum of offensive ability is more than enough to overmatch any of Russia’s neighbors (with the exception of China). The third and most likely scenario is that Ukraine will remain united, remain cleft, remain independent, and generally cooperate closely with Russia… Just as the [Franco-German relationship] provides the core of the European Union, the [Russian-Ukrainian relationship] is the core essential to unity in the Orthodox world. With all major Ukrainian political blocs re-orientating themselves to Russia and the two countries increasing their cooperation in spheres ranging from politics to the military-industrial complex, Huntington’s prediction could be said to have been fulfilled. Russia, China, Iran redraw energy map by the always-insightful Indian diplomat M K Bhadrakumar. Second, Russia does not seem perturbed by China tapping into Central Asian energy. Europe’s need for Russian energy imports has dropped and Central Asian energy-producing countries are tapping China’s market. From the Russian point of view, China’s imports should not deprive it of energy (for its domestic consumption or exports). Russia has established deep enough presence in the Central Asian and Caspian energy sector to ensure it faces no energy shortage. What matters most to Russia is that its dominant role as Europe’s No 1 energy provider is not eroded. So long as the Central Asian countries have no pressing need for new US-backed trans-Caspian pipelines, Russia is satisfied. During his recent visit to Ashgabat, Russian President Dmitry Medvedev normalized Russian-Turkmen energy ties. The restoration of ties with Turkmenistan is a major breakthrough for both countries. One, a frozen relationship is being resumed substantially, whereby Turkmenistan will maintain an annual supply of 30bcm to Russia. Two, to quote Medvedev, “For the first time in the history of Russian-Turkmen relations, gas supplies will be carried out based on a price formula that is absolutely in line with European gas market conditions.” Russian commentators say Gazprom will find it unprofitable to buy Turkmen gas and if Moscow has chosen to pay a high price, that is primarily because of its resolve not to leave gas that could be used in alternative pipelines, above all in the US-backed Nabucco project. Third, contrary to Western propaganda, Ashgabat does not see the Chinese pipeline as a substitute for Gazprom. Russia’s pricing policy ensures that Ashgabat views Gazprom as an irreplaceable customer. The export price of the Turkmen gas to be sold to China is still under negotiation and the agreed price simply cannot match the Russian offer. Fourth, Russia and Turkmenistan reiterated their commitment to the Caspian Coastal Pipeline (which will run along the Caspian’s east coast toward Russia) with a capacity of 30bcm. Evidently, Russia hopes to cluster additional Central Asian gas from Turkmenistan (and Kazakhstan). Fifth, Moscow and Ashgabat agreed to build jointly an east-west pipeline connecting all Turkmen gas fields to a single network so that the pipelines leading toward Russia, Iran and China can draw from any of the fields. Indeed, against the backdrop of the intensification of the US push toward Central Asia, Medvedev’s visit to Ashgabat impacted on regional security. At the joint press conference with Medvedev, Berdymukhammedov said the views of Turkmenistan and Russia on the regional processes, particularly in Central Asia and the Caspian region, were generally the same. He underlined that the two countries were of the view that the security of one cannot be achieved at the expense of the other. Medvedev agreed that there was similarity or unanimity between the two countries on issues related to security and confirmed their readiness to work together. The United States’ pipeline diplomacy in the Caspian, which strove to bypass Russia, elbow out China and isolate Iran, has foundered. Russia is now planning to double its intake of Azerbaijani gas, which further cuts into the Western efforts to engage Baku as a supplier for Nabucco. In tandem with Russia, Iran is also emerging as a consumer of Azerbaijani gas. In December, Azerbaijan inked an agreement to deliver gas to Iran through the 1,400km Kazi-Magomed-Astara pipeline. The “big picture” is that Russia’s South Stream and North Stream, which will supply gas to northern and southern Europe, have gained irreversible momentum. The stumbling blocks for North Stream have been cleared as Denmark (in October), Finland and Sweden (in November) and Germany (in December) approved the project from the environmental angle. The pipeline’s construction will commence in the spring.The $12-billion pipeline built jointly by Gazprom, Germany’s E.ON Ruhrgas and BASF-Wintershall, and the Dutch gas transportation firm Gasunie bypasses the Soviet-era transit routes via Ukraine, Poland and Belarus and runs from the northwestern Russian port of Vyborg to the German port of Greifswald along a 1,220km route under the Baltic Sea. The first leg of the project with a carrying capacity of 27.5bcm annually will be completed next year and the capacity will double by 2012. North Stream will profoundly affect the geopolitics of Eurasia, trans-Atlantic equations and Russia’s ties with Europe. To be sure, 2009 proved to be a momentous year for the “energy war”. The Chinese pipeline inaugurated by President Hu Jintao on December 14; the oil terminal near the port city of Nakhodka in Russia’s far east inaugurated by Prime Minister Vladimir Putin on December 27 (which will be served by the mammoth $22-billion oil pipeline from the new fields in eastern Siberia leading to China and the Asia-Pacific markets); and the Iranian pipeline inaugurated by Ahmadinejad on January 6 – the energy map of Eurasia and the Caspian has been virtually redrawn. Putin ordered construction to start on Nord Stream at the end of last year after the pipeline got the last environmental permits from Germany. And in January, Gazprom started building the first pumping station at the mouth of the first of two parallel pipes, which is supposed to be operational by 2011 with a capacity of 27.5bn cm/y. Thanks to Nord Stream, 2009 should be the last episode of the Russo-Ukraine “Gas for Cash” soap opera, which usually ends with Europe freezing. [AK: see also What difference would Nord Stream mean to European energy supply?]. South stream, the other pipeline project, will close the circle, but this pipeline has had a harder time getting off the drawing board and is competing with the EU-sponsored Nabucco pipeline, which is supposed to source Caspian region and Middle East gas and send it to Europe without crossing Russian soil. The problem is that there’s probably only enough demand to support one pipeline. Russia was undoubtedly far more affected by the international crisis that started in September 2008 than anyone had expected – especially the Kremlin. It also stands out as the only one of the BRIC countries (Brazil, Russia, India, China) to show negative growth, leading to calls from the likes of analyst Anders Aslund to remove the “R” from BRIC. This was one of my major themes. When the Western financial system ground to a standstill in late 2008, the first countries to be cut off were the emerging markets. 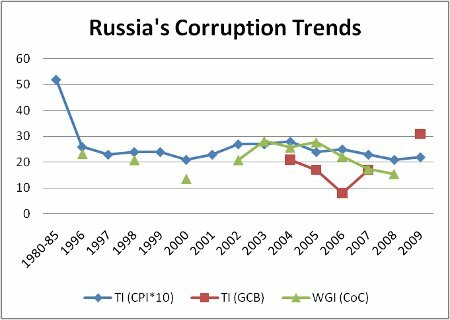 Having access to deep indigenous credit systems, the likes of Brazil and China were understandable far less affected than Russia, whose corporations had come to rely on Western intermediation of their credit inflows. And in the longer term, excluding Russia from the BRIC’s makes little sense given its major growth potential (educated workforce, resource windfall, modernization policy, economic gains from global warming). The Russian economy contracted by a bit less than 9% in 2009, but as the year came to a close it was already starting to recover – six months later than analysts were predicting at the start of the year. However, despite the pain of the crisis, the prospects for 2010 are looking much better than many had dared hope. One should also note that this “pain” was insubstantial compared to the 1998 crisis, which is what many analysts were (unfavorably) comparing it to. While the percentage of the population barely making ends meet went up from 29% in July 1998 to 40% in December 1998, this figure remained stable at around 10% throughout the recent crisis. The main shift occurred amongst Russia’s “consumer class” (the ones who buy cars, PC’s, etc), whose percentage of the population tumbled by a quarter from 19% to 14%, and perhaps explains the reason for its large drop in GDP for 2009, i.e. the drop in large purchases. The silver lining is that this implies inequality has decreased during the crisis. The much discussed problems of the reappearance of a budget deficit will be much milder than appears now, coming in at something under 5% of GDP. This means the Kremlin will drastically reduce its international borrowing and has already cut the amount it needs to raise from $18bn to $10bn, but this could fall to $5bn or even nothing at all if oil prices rise to around $80 per barrel, which most of the banks bne surveyed believe will be the average price for 2010. Indeed the state will be able to raise all the money it needs to plug the deficit at home and pave the way for a return of private issuers to the international capital markets. I predicted an oil price of around 90$ for 2010 (“oil prices in H1 will remain at 70-90$, and will rise to 90-110$ in H2”), so this is completely realistic considering my stellar record on oil price forecasting. Finally, the RTS had a spectacular performance, rising over 120% in 2009 from its spring lows to end the year at about 1400. Unlike last year, the investment banks all agree that the index will end 2010 at around 1900-1950 and some say that it will reach and pass its all-time high of 2600 by 2011. The themes for 2010 include: a turning inwards to growth driven by domestic demand, a push to introduce some real bottom-up economic reforms, a new focus on improving Russia’s productivity, increased inter-regional crediting, a shift towards closer ties with China, consolidation within many sectors and most important a gradual reassessment of Russia’s risk. The collapse of the Russian economy in 2009 was dramatic, but emerging market crises are intrinsically less “sticky” than those in the West, largely because of the shallow penetration of debt in all its forms into the economy. As Liam Halligan, chief economist at Prosperity Capital Management, points out Russia’s fundamentals remain extremely strong and stand out from the rest of emerging Europe. And despite spending $200bn on rescue packages, the Kremlin still have $400bn in the bank, which was increasing again towards the end of the year, and remains the third richest country in the world after China and Japan, against the US and UK, which are 18th and 19th with a bit more than $80bn each. As the story going forward for the next several years will be all about the credit worthiness of countries, Russia finds itself, along with its newest buddy, China, in an enviable position. Feel free to read the whole article. Russia registers its first year of population growth in 2009 since 1994. I will make some concrete, falsifiable demographic predictions (something Russophobes going on about Russia’s impending demographic doom wisely avoid doing). I was totally correct, and even better, a year early! (well, just about). Meanwhile, the Russophobe commentariat continues their happy life in la la land. b) Russia’s approaching demographic doom is a major staple of pessimist and Russophobe assessments of its future prospects in areas like economic modernization and geopolitical power. To the contrary, far from the steep fall produced by most demographic models, a more realistic scenario is for Russia’s population to stagnate or grow very slowly in the next two decades, as a fall in the numbers of women in child-bearing age is balanced out by rising fertility rates and falling mortality rates. See 10 Myths about Russia’s Demography for my detailed exposition of Russia’s demographic prospects. The leader of Georgian opposition party the Movement for a Fair Georgia, former Prime Minister Zurab Nogaideli, said Jan. 26 that his party would like to form a partnership with United Russia, the ruling party in Russia led by Prime Minister Vladimir Putin. See also this Russian-language report, Танки августа (“Tanks of August”) analyzing the buildup to, chronology, and course of the 2008 South Ossetian War, which is called “The Five Day War” in this publication. This is no pro-Kremlin propaganda, the Russian Army receives acerbic criticism for its performance. However, most interesting, at least for me, was the chapter “Настоящее и будущее грузино-российского конфликта. Военный аспект” (pp. 85-109), a serious analysis of post-war dynamics in the balance of power between the two countries, is worth checking out. I’ll summarize it here. a) Though Georgian military spending has fallen somewhat from its 2007-08 high of 8% of GDP, its military potential has continued growing at a fast rate and now exceeds its level in August 2008. Anti-partisan training has been deemphasized in favor of preparation for a hot conventional war against Russia, especially emphasizing the anti-tank and air defense aspects; battle-hardened troops have been returned from Iraq, the reserves system is being reformed, and military contracts concluded in 2007-08 are now bringing in masses of new Soviet and Israeli military equipment from abroad. The authors believe it is not unrealistic that Georgia will make another attempt at a military resolution of the Ossetian issue after 2011.
b) Counter-intuitively, the authors believe that though the revolutionary reforms now being implemented by the Russian Army will enhance its long-term potential, in the short-term there will be a certain loss of effectiveness due to the ouster of experienced officers, a shortfall which will not be immediately made up by the extensive NCO-training program which is only now getting started. The effective number of Motor Rifle and Tank battalions in the Caucasus military region has fallen from 65 in August 2008 to just 40 at end-2009, albeit their quality has been somewhat improved thanks to the rapid acquisition of modernized tanks and helicopters. Furthermore, their forward-positioning in Abkhazian and S. Ossetian bases will give them an advantage missing in 2008.
c) Finally, the authors also note the growing military superiority of Azerbaijan over Armenia. The two countries hold a long grudge over Armenia’s occupation of the ethnically-Armenian enclave of Nagorno-Karabakh. Revenues from the BTC pipeline have enabled Azerbaijan to massively increase its military potential, acquiring a panoply of modernized late-Soviet and Israeli weapons systems. Azerbaijan’s military budget now exceeds the entire Armenian state budget. However, Armenia is allied with Russia through the CSTO, hosts a big Russian base, and receives subsidized weapons systems from Russia, as well as some old Soviet stocks for free. The authors note that due to ethnic majority-Armenian unrest in the southern Georgian province of Samtskhe-Javakheti (which I noted in my post on the possibility of a new Russia-Georgia war), Russia would be wise to increase its military presence in Armenia and accelerate the modernization of the Armenian armed forces in order to be able to exploit Georgia’s soft southern underbelly in a new war***. Two more military things. 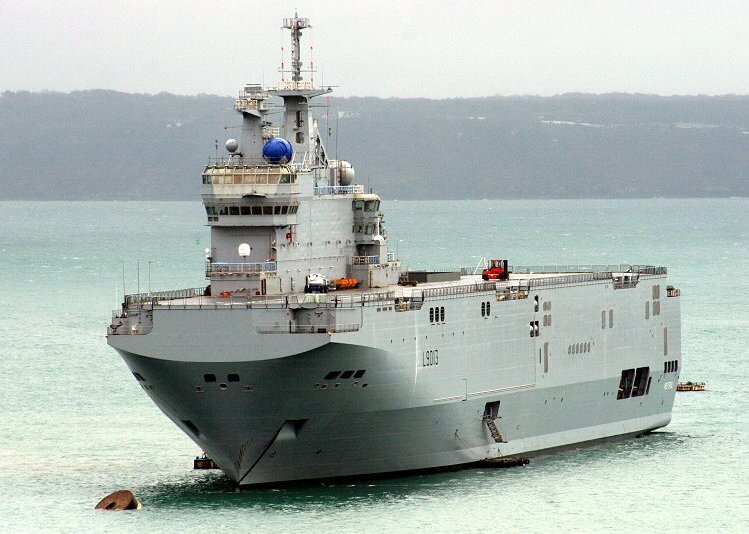 Frustrated with the sorry state of Russian military shipbuilding, the Kremlin is considering the French Mistral, a helicopter carrier & amphibious ship. Such an acquisition will enhance two important Russian capabilities. First, if deployed in the Barents Sea, it will reinforce its anti-submarine warfare (ASW) capabilities, which are growing in importance with its increasing strategic interests in the Arctic linked to the region’s oil-and-gas deposits and potential trade opportunities as the sea-ice melt accelerates. Second, these vessels would enable Russia to insert crack military forces behind enemy lines much quicker than had previously been possible. In the event of a potential conflict with Georgia or the Baltics, this capability will be incredibly valuable. EDIT to add PAK-FA news: Second, Russia unveiled the PAK-FA prototype fighter, the first 5th-generation fighter to be produced outside the US. Below are some informative articles on the subject. Despite delays and questions over its effectiveness, Russia being the 2nd nation in the world to test a 5th generation fighter after the US does prove that elements of the Russian MIC, especially military aviation, remain robust and capable of innovation. (Besides, one shouldn’t neglect to mention that the American MIC also has its own problems: cost overruns, questions over the JSF’s real utility, etc). As pointed out in earlier posts, Russia’s main challenge is now rooting out corruption and modernizing the MIC’s machine tools and management culture to enable high-volume production of state-of-the-art military equipment such as the PAK-FA, so as to modernize its armed forces by 2020 without returning to a Soviet-style militarized economy. * To forestall criticism, this is not, of course, an expression of “Great Russian chauvinism”, but a historical reference to the state centralization and “gathering of the Russian lands” undertaken by Muscovy from the time of Ivan III (1462-1505). This formed the palimpsest for all future restorations of Russia’s empire, including the current one. ** Why Yanukovych will almost certainly win the Ukrainian Presidency – just a matter of beans-counting. In the first round, he got 35%, Tymoshenko got 25%. Yanukovych will net many of the Tihipko voters (13%), while Tymoshenko will get support from some of the Yatsenyuk (7%) and Yushenko (5%) voters. The rest of the electorate will split roughly in half, most likely. But even if Tymoshenko gets very lucky, it is hard to see her closing the awning 10% gap separating her from Yanukovych in the first round. *** I would also add that though unlikely, it is not impossible that Armenia and Azerbaijan will fight a new war in the near future, as the Azeris despair of their long-term chances of ever reclaiming Nagorno-Karabakh in the face of Turkish-Armenian reconciliation and the hard reality of rising Russian power over the Caucasus. They could yet make a desperate gamble, perhaps in the context of the chaos unleashed by a US-Israeli war with Iran and its proxies. That said, the far likelier possibility is that the realistic-minded President Aliyev will reconcile himself to Russia’s growing power over the Caucasus. 14 Comments to "Regathering of the Russian Lands"
This is already happening in other countries: in Estonia of all places, the Center Party (currently the largest) has a “cooperation agreement” with UR. I did a little survey on this myself a day or two after the election. It’s really quite eerie – you’d think there would be some sort of post-mortem at least. But most of the neocon outlets I’ve looked at have totally ignored it. Reminds me of how Pravda used to treat inconvenient news. 1. The EU is certainly where it looks like it's going to in the future. Of course there are two major differences: Russia would dominate any such "East Slavic Union" (though it will probably be four nations actually, with Kazakhstan) in a way than even the Franco-German bloc can't dream of doing with the EU; and based on past history the integrationist trend may continue going on and on well past the EU-like structure into something more closely resembling the USSR or even Russian Empire. In any case, time will tell. 2. Though I love the symbolism of Kyiv becoming the capital of such a confederation, it is unlikely to happen for practical reasons. First, there's much more of the political infrastructure already in place in Moscow. Second, Kyiv is close to Poland, which is in NATO. Third, Kyiv doesn't have the same specialized nuclear defense infrastructure as Moscow (specialized underground railway lines for evacuating national policy-makers, the A-135 system, etc), constructing which will be very expensive, not to say very un-PC in our day and age. One of the problems with your scenario is – economic benefits for whom? Certainly not for the East Ukrainian oligarchs and industries, who would be crushed by Russian competition. This is what the West does not get about Yanukovich: he’s not so much “pro-Russian” as “pro-East Ukrainian.” His job is to protect that piece of economic turf. Treating him as a Russian Trojan horse is a misinterpretation of his real role. Anyway, we’ll see – I wouldn’t rule anything out. "The third and most likely scenario is that Ukraine will remain united, remain cleft, remain independent, and generally cooperate closely with Russia"
"There has been talk of a possible political union between United Russia (Russia’s “party of power”) and the Party of Regions"
This is already happening in other countries: in Estonia of all places, the Center Party (currently the largest) has a "cooperation agreement" with UR. "The (relative) silence about the total collapse of the Orange party in Ukraine on the part of normally Russophobic outlets has been deafening." I did a little survey on this myself a day or two after the election. It's really quite eerie - you'd think there would be some sort of post-mortem at least. But most of the neocon outlets I've looked at have totally ignored it. Reminds me of how Pravda used to treat inconvenient news. 1. The EU is certainly where it looks like it’s going to in the future. Of course there are two major differences: Russia would dominate any such “East Slavic Union” (though it will probably be four nations actually, with Kazakhstan) in a way than even the Franco-German bloc can’t dream of doing with the EU; and based on past history the integrationist trend may continue going on and on well past the EU-like structure into something more closely resembling the USSR or even Russian Empire. In any case, time will tell. 2. Though I love the symbolism of Kyiv becoming the capital of such a confederation, it is unlikely to happen for practical reasons. First, there’s much more of the political infrastructure already in place in Moscow. Second, Kyiv is close to Poland, which is in NATO. 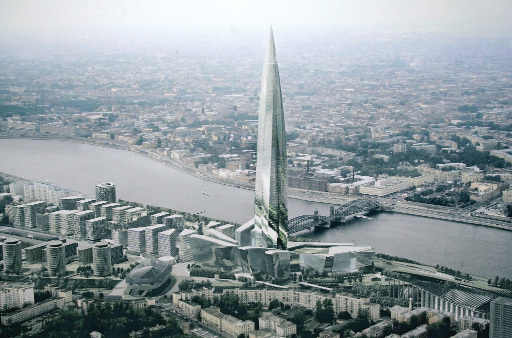 Third, Kyiv doesn’t have the same specialized nuclear defense infrastructure as Moscow (specialized underground railway lines for evacuating national policy-makers, the A-135 system, etc), constructing which will be very expensive, not to say very un-PC in our day and age. The greater integration trend of Russia would not be desired nor matched in Ukraine and would probably break the union apart or lead to conflict. That's one of the historically fundamental problems in Russia-Ukraine relations. Russian political culture is more authoritarian and seeks centralization while Ukraine is more democratic-chaotic and seeks independence or sovereignty. The more that Russia would seeks to push for integration, the more Ukraine will push back. Some people are saying Tymoshenko has a realistic chance of becoming President, e.g. plagiarist Luke Harding even goes as far as to say she is “set to be the country’s first female president. This seems surprising given the amount of evidence pointing against this happening. Research & Branding Group: as reported by RIA Novosti, nationwide: Yanukovych 44.9%, Tymoshenko 31.6%. Now I know opinion polls are unreliable and so on, but not to such a huge extent as one showing a 15% gap. 2. Basic tallying; let’s look at the candidates on Jan 17. Assume Yanukovych and Tymoshenko retain loyalty of their followers. Tihipko has his power base in “Blue” Dniepropetrovsk, was a Kuchma ally, and helped Yanukovych run his 2004 campaign; his people will mostly vote for Yanukovych, but let’s be generous to Tymoshenko and say only 60% support Yanukovych. However, she will get the bulk of Yatsenyuk (80%) and Yushenko (80%) voters. The Communists are firm “Blues”, so say 80% of them will vote for Yanukovych. The political gadfly Lytvyn’s people will strongly support Tymoshenko (80%), as will the nationalist Tyahnybok’s people (80%) and Our Ukrainian Hrytsenko (80%). Bohoslovska on a mostly anti-Tymoshenko program, so her people are Yanukovych’s (80%). The others on the list – Moroz, Kostenko, Suprun, Pabat, Ratushniak, Brodskyy, Riabokon seem to be mostly Timoshenko’s – let’s be generous and say 80%. The supporters of Protyvsih will presumably honor his legacy and vote against all. Adding up these figures, Yanukovych gets 50% of the votes, whereas Tymoshenko gets 46%. 1) That the generous estimates above translate into real votes. 2) A boost of around 10% in additional votes from de-motivated voters in west-central Ukraine, presumably enchanted by her charisma or as an anti-Yanukovych protest vote. But this implies a huge boost in turnout to above the levels of the politically-charged Orange Revolution. It is safer to say that Yanukovych will win with a gap wide enough that Tymoshenko will not have grounds to make a legal wrangle out of it – though that is just about possible if she’s very lucky and comes within 1-2% points of Yanukovych. But my prediction is a Yanukovych win by 5-10% points over Tymoshenko. I observe that the vote in Zakarpatia is somehow atypical for Western Ukraine. This is not the first time such a thing happened. I decided to investigate Rusyn national movement for my dissertation, this would be an interesting area to investigate. Good luck with the dissertation! If what people have told me is true of phD programs, by the end you should be one of the world's foremost experts on the Rusyns, or whatever your end up choosing as your final subject matter. Rusyns are indeed interesting – they contributed one of America’s most iconic artists (Andy Warhol) and one of its greatest jazz pianists (Bill Evans). Rusyn region used to be part of Slovakia, right? Good luck with the dissertation! If what people have told me is true of phD programs, by the end you should be one of the world’s foremost experts on the Rusyns, or whatever your end up choosing as your final subject matter. I think Stratfor is selling us snake oil. I would like to know who funds Stratfor, who are its financial backers? Stratfor is the intelligence front of the narrative Tom Clancy has been pushing which basically while somewhat critical of US actions puts it in the context of a pro-US narrative void of the realities for fraudulent justification for US presence and activities there. About Al Qaeda and international terrorism, Chechnya and the Eurasian sphere and basically Russia in general and allied countries, Balkans, even the dominant political realities in the US and policy in the Mid East (Saudis have predominant influence in the US and tell the US what to do LOL). I have been predicting exactly what is going on now in Eurasia for years with is documented from the very start of the fall of the USSR that the US has been positioning and orienting Europe towards a conflict and break up with Russia which they were realigning the countries and borders against Russia. The Balkans is just what the Nazis did in WW2 as a bridge to attack Russia. Russian actions are a counter to this encirclement and division process who don’t want to end up like the Serbs. Actually I have been doing research about real history to the lead up to and western support of the Bolshevik takeover of Russia whilst unsuccessfully supporting separatist/ anti Communist factions in Siberia and the Caucasus securing key oil and gas natural resources for western allies. WW2 was used to orchestrate war using Germany and the fascist allies mainly Japan as a proxy to launch war against the USSR. After that failed Britain and the US recruited and supported Nazi created or affiliated anti-Communist guerrilla forces to carry out attacks in the USSR trained in Germany and Britain and well as all there anti-Communist propaganda material to launch a Cold War against the USSR. The stay behind forces were used in the Balkans conflict most noticeably in Croatia with Tudjman who was a BND agent and Croat Ustashi were fully backed Germany and German intelligence. It continues today. The Brezinski/Obama regime like Carter before it as creating and setting up the stage for a major confrontation with Russia with Palin and the Republicans will take the lead like Reagan before her in 2012. Now we are entering the endgame. The greater integration trend of Russia would not be desired nor matched in Ukraine and would probably break the union apart or lead to conflict. That’s one of the historically fundamental problems in Russia-Ukraine relations. Russian political culture is more authoritarian and seeks centralization while Ukraine is more democratic-chaotic and seeks independence or sovereignty. The more that Russia would seeks to push for integration, the more Ukraine will push back. The feedback loop goes the other way too. Once integrationist dynamics set in, they can be very hard to reverse or undo. Once Ukraine achieves some level of institutional reintegration into the Eurasian space, I suspect the process will become self-reinforcing. Ukraine is only "democratic-chaotic" when Eurasia is weak; when Eurasia recovers, Ukraine tends to quietly slip back into the fold. I see no reason why this iteration should be different from past history. With two more days to go, I see no reason to stray from my prediction of a Yanukovych win. Furthermore, I will diverge from the consensus amongst the commentariat to forecast that he will win by a substantial margin of 5-10%. 1) Opinion polls indicate a 15% (!) gap. 2) My detailed tallying of whose people will vote for Mr. Blue and whose for the Gas Princess indicate that even under assumptions very favorable to Tymoshenko, she will still lose by a 4% point margin. 3) The very high west-central turnout she needs to have any chance is unlikely to materialize based on common sense and even the anecdotal evidence. a) West-central Ukrainians are almost as suspicious of Tymoshenko as Yanukovych; one argument even goes that whereas everyone knows where Mr. Blue stands regarding Russia and will oppose him, Tymoshenko will sell it out under the table. b) Yushenko, by discouraging voters in the western regions from voting, is intentionally aiding Yanukovych’s campaign. Some have speculated that Yanukovych and Yushenko have a secret deal in the works. c) The general disillusionment with democratic politics. (That said, a resounding Yanukovych win will not *necessarily* be good for Russia. As pointed out he does not represent Russian interests so much as the interests of the Donbass oligarchs, so he will not necessarily see eye to eye with the Kremlin. A substantial mandate like that would mean that an important lever of Russian influence in Ukraine – playing both sides of the chessboard – would become weakened). OK, elections have passed. Almost 90% of the votes have been counted. Yanukovych 48.59% – Tymoshenko 45.76%, so Yanukovych will almost certainly take the Presidency. Overall I am fairly happy with my predictions for the Ukrainian elections. I called the top four candidates in the first round perfectly, and it was also then that I predicted Yanukovych’s eventual victory (see above). Later on, I predicted a Yanukovych win by 5-10%, though I did add the caveat that “though that is just about possible if she’s very lucky and comes within 1-2% points of Yanukovych”. Boy am I glad I did. PS. So the results I got from adding up the estimated percentages of each candidate’s voters going over to either Mr. Blue or the Gas Princess turned out to be very, very accurate. The feedback loop goes the other way too. Once integrationist dynamics set in, they can be very hard to reverse or undo. Once Ukraine achieves some level of institutional reintegration into the Eurasian space, I suspect the process will become self-reinforcing. Ukraine is only “democratic-chaotic” when Eurasia is weak; when Eurasia recovers, Ukraine tends to quietly slip back into the fold. I see no reason why this iteration should be different from past history.